The Leopard tank has seen many changes and been fielded by many countries. Canada retired its tank forces for wheeled vehicles and then had to lease tanks from Germany for operations. The Leopard tank is now back operating with the Canadian Armed Forces as the Leopard 2A4M Can. This book covers the Leopard tank in Canadian hands and provides a good photographic look around. This is the 17th book in Tankograd Publishing In Detail Fast Track series of books. These books are intended to be released quickly after a model release as reference for the modeller. 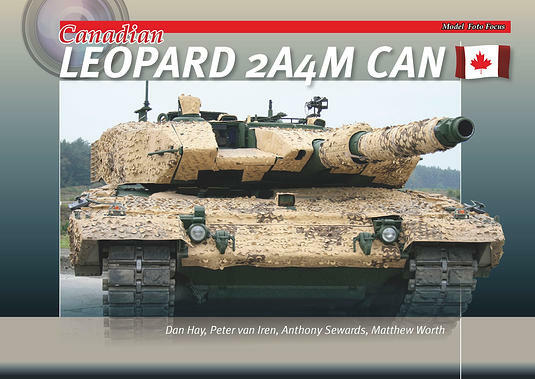 This offering covering the Leopard 2A4M Can starts with three pages of text; all in English. The text covers how and why Canada ended up with a tank force after deciding to replace its tank forces with wheeled vehicles. The text also touches upon the tank forces deployment to Afghanistan and the differences that are specific to these tanks. The photographs in the book are in full colour and of a very good quality. The photographs also have very good text captions with them, these provide a good deal of information on what you are looking at and points out specifics for you to note. The pictures begin with a walk around of the vehicle as a whole. These images provide a good level of detail, in particular the barracuda MCS that is fitted to these vehicles. I wonder how long it will be until an injection moulded leopard with the barracuda in place is available. One thing that I really do like about the images in this title generally, is that the tanks has been photographed dirty in many cases. This provides information to the modeller on areas of the vehicle that accumulate the most muck. The hull of the tank then gets special attention next. Areas that modellers will find interesting in the passive armour and close ups of the barracuda sheeting. Also take note of the front and rear cameras that allow the tank to operate at night and all weather capabilities. The main gun and loaders MG are next to come in for a closer look. The images displayed here will be very helpful for an area I struggle with often, the loaders MG; it is one of those areas where I am never quite happy with how it is placed or the detail. The engine bay and power pack are next. These sections will be of great use to anyone looking to show the power pack out of the tank or being lowered in. pay special attention to where dirt and grime accumulates. The slat armour is now presented in quite an extensive way. Information that I never realised is that the slat armour is nearly always damaged, at least on it bottom edge. The vehicles sent to Afghanistan had damaged slat armour just from being loaded and un-loaded on the journey out. This particular section will likely be one of the most useful sections for any modeller tackling slat armour. The turret is now covered, details such as the smoke dischargers hidden behind the add on armour and radio mounts will be of particular use to the modeller. The storage bins at the rear corners of the turret have been photographed loaded up with odds and sods. The crew’s use of chicken wire from the rear of the turret to the slat armour to create another storage bin is great information. The last area of the tank proper to be covered is the running gear. There is one other aspect of the Leopard that is covered in some detail, and that is the mine roller system. The mine roller system is covered in what I would consider a great deal of detail considering this book has 40 pages and 6 of those have been turned over to this single aspect. I have to admit that tanks with anti mine systems fitted do look intimidating. This is another impressive title in the In Detail Fast Track series of books. Every aspect of the tank has been covered as far as the exterior is concerned, and this should allow and enable the modeller to produce an accurate model depending on their skill set. Highs: the detail that has been picked out to help those that need the prompting. Lows: No obvious lows here. Verdict: A great new addition to the Tankograd range of titles. Looks interesting, but I'm a bit confused because of the other book from Trackpad Publishing. I don't know which one to choose. Both will complement each other. The Tankograd book will for sure show the tanks in an operational setting in Afghanistan. Carl Schulze did an excellent job of photographing the five Leopard 2A4M CANs of the 12e Régiment blindé du Canada deployed for combat operations. The Trackpad Publishing Leopard 2A4M CAN book and my Canadian Leopard 2 Reference Image DVD set concentrate on the tanks in Canada. Thank you Jason. I'm looking for ISAF pics so I will choose the Tankograd one. Competition to this book is provided by Trackpad Publishing with a book of the same title. Trackpad's book is more expensive, but in its 80 pages you get 250 photos. Where the Tankograd book concentrates on the tank in Afghan guise, the Trackpad book looks at the tank in service in Canada without the slats and without the Barracuda (though Afghanistan is also well covered). The Trackpad book also takes a brief look at the ordinary 2A4 in Canadian service. With the upcoming model from HobbyBoss due any time now, both books should have room on the bookshelf of any Leopard fan. In my opinion, the two books do not clash with each other, but compliment each other nicely.